This building was one of the first 5 Star Green Star buildings in Australia. Water Cooled Turbo-Cor chiller plant complete with low load chiller, multiple load chillers and cooling towers complete with refrigerant detection. Central plant CHW AHU located on roof plantroom with VAVs located throughout the tenancy floors. Carpark exhaust and supply air systems, multiple back of house ventilation systems and water-cooled packaged units for supplementary cooling for tenants. Central Plaza Complex began as one man’s wish to build something different. Serge de Kantzow, Director of Land Equity Corporation, was responsible for the project’s inception. His architectural design brief set the challenge of Central Plaza becoming an international architectural statement for Brisbane. The design that embodied those words was created by internationally renowned architect Dr Kisho Kurokawa. His design of the exterior of Central Plaza reflects the contours of a fine crystal, with glass windows that score the sheer white walls and connect with the glass curtain of the building’s splayed corners. 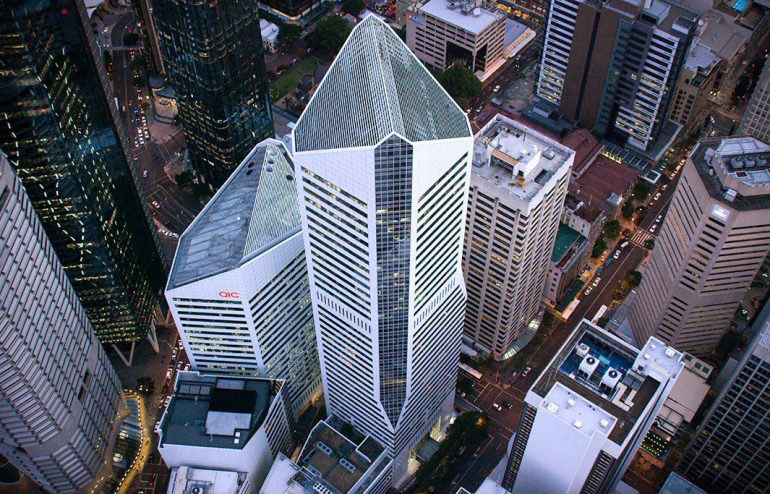 Central Plaza’s unique and ultra-modern design is sophisticated and provides a striking icon on the Brisbane skyline.